The first time that we saw this kind of deck was when a friend came back from Japan and had brought us one. We had just begun collecting nonstandard decks and had asked him if he could bring a deck of unusual cards back with him. And so he did! We were amazed by the strange designs, but a bit disappointed that there were only 48 cards (+1 extra card) and no indices or cardcolours used. We found out that the deck was called Hanafuda or Flower deck and, although we basicly don't collect any decks without suitcolours (of whatever kind), we kept the deck as an oddity. We later learned that the deck -shown here below- wasn't made in Japan, but in South Korea. - Cards with animals or figures: 10 or 20 points. - Cards with a Tanzaku, a strip of poem writing paper. They come in 3 styles: red strip with poem, empty red strip and emptyl blue strip. All are 5 points. - Cards with plants, but no other objects, are called "Kasu" or "Trash" cards. All are 1 point. The game has a long history -it was forbidden in the Edo period (1603-1867) and re-discovered in the Meji period (1868-1912)- but the designs of the individual cards (the pattern) hasn't really changed over the last few centuries. 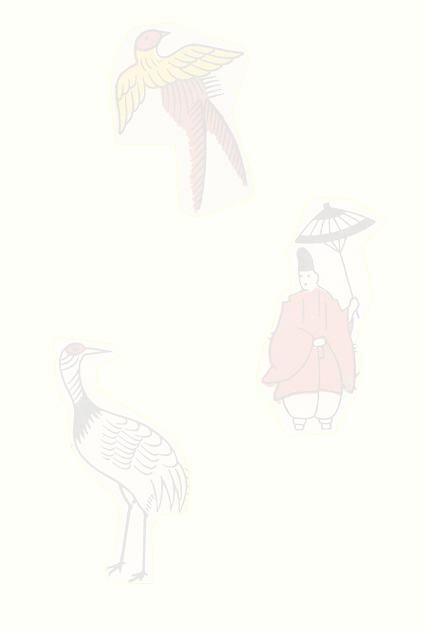 Matsu ni Tsuru (Crane and Pine) 20 points, Matsu no Tan (Poem strip with Pine) 5 points, 2 x Matsu no Kasu (Trash of Pine), each 1 point. In this deck all the 20 points cards have been specially marked with a red dot with a character. Ume ni Uguisu (Nightingale and Plum) 10 points, Ume no Tan (Poem strip with Plum) 5 points, 2 x Ume no Kasu (Trash of Plum), each 1 point. Sakura ni Maku (Curtain and Cherry Blossoms) 20 points, Sakura no Tan (Poem strip and Cherry Blossoms) 5 points, 2 x Sukara no Kasu (Trash of Cherry Blossoms), each 1 point. Fuji ni Kakko (Cuckoo and Wisteria) 10 points, Fuji no Tan (Poem strip and Wisteria) 5 points, 2 x Fuji no Kasu (Trash of Wisteria), each 1 point. Ayame ni Yatsuhashi (Eight-board Bridge and Iris) 10 points, Ayame no Tan (Poem strip with Iris) 5 points, 2 x Ayame no Kasu (Trash of Iris), each 1 point. Botan ni Chou (Butterflies and Peony) 10 points, Botan no Tan (Poem strip with Peony) 5 points, 2 x Botan no Kasu (Trash of Peony), each 1 point. Hagi ni Inoshishi (Wild Boar and Bush Clover) 10 points, Hagi no Tan (Poem strip with Bush Clover) 5 points, 2 x Hagi no Kasu (Trash of Bush Clover), each 1 point. Susuki ni Tsuki (Moon and Pampass Grass) 20 points, Susuki ni Kan (Wild Geese with Pampass Grass) 10 points, 2 x Susuki no Kasu (Trash of Pampass Grass), each 1 point. Kiku ni Sakazuki (Sake Cup with Crysantemum) 10 points, Kiku no Tan (Poem strip with Crysantemum) 5 points, 2 x Kiku no Kasu (Trash of Crysantemum), each 1 point. Momiji ni Shika (Deer and Maple) 10 points, Momiji no Tan (Poem strip with Maple) 5 points, 2 x Momiji no Kasu (Trash of Maple), each 1 point. Yanagi ni Ono no Toufuu (Ono no Toufuu and Willow) 20 points, Yanagi ni Tsubame (Swallow and Willow) 10 points, Yanagi no Tan (Poem strip and Willow) 5 points, Yanagi no Kasu (Trash of Willow), 1 point. Kiri ni Hooh (Phoenix and Paulownia) 20 points, 3 x Kiri no Kasu (Trash of Paulownia), each 1 point.